Indian Air Force has released vacancies for the courses commencing in January 2019 for grant of Short Service Commission (SSC) in Flying Branch and Permanent Commission (PC) / Short Service Commission (SSC) in Ground Duty (Technical and Non-technical) Branches. Online applications are also invited for grant of PC/SSC for Flying Branch through NCC Special Entry Scheme and Meteorology Entry. through Air Force Common Admission Test (AFCAT) - 01/ 2018. 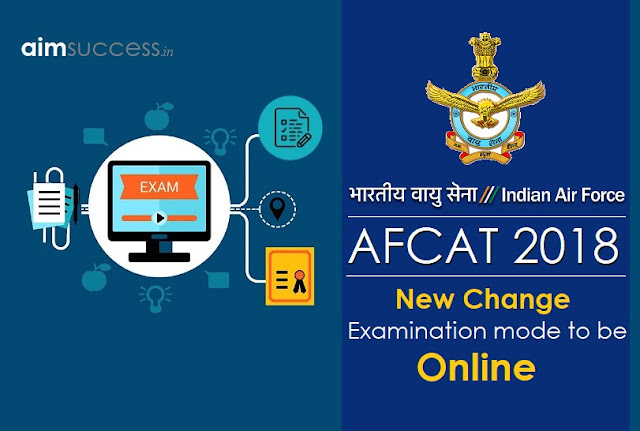 Important Note: For the first time, online testing will be conducted for AFCAT entry in various AFCAT centers. Below I’m sharing with you minimum eligibility requirements for Flying, Ground Duty Non-Technical and Technical branches for AFCAT 1 2018. Educational Qualification: 60% marks in Graduation with any discipline along with Phy & Math at class 10+2 OrE/B.Tech or 60% marks in section A & B examination of Aeronautical Society of India or Associate Membership of Institute Engineers (India). Age Criteria: In between 02 January 1995 to 01 January 1999 (Both Dates inclusive). Upper age limit will be relaxed up to 26 years if you have valid and current Commercial Pilot License issued by DGCA (India). Educational Qualification: Obtained 60% marks in Graduation in any discipline along with Phy & Math at class 10+2 Or complete 4 years graduation or integration post graduation in Engineering or Technology or 60% marks in section A & B examination of Aeronautical Society of India or Associate Membership of Institute Engineers (India). Age Criteria: In between 02 January 1993 to 01 January 1999 (both dates inclusive). Educational Qualification: Secured 60% marks in Graduation in any discipline and 60% marks in section A & B examination of Aeronautical Society of India or Associate Membership of Institute Engineers (India). There are few added criteria for other sections under Ground Duty Non-Technical. You must read our full article for the same.